The Oregon Symphony brilliantly performed three kinds of concertos on Sunday night in a concert that gradually expanded in scale from small to very large. Music conductor Carlos Kalmar led the orchestra with Stravinsky's Concerto in D major for String Orchestra, Lutoslawski's Concerto for Orchestra, and Brahms' Second Piano Concerto with the dynamic British pianist Stephen Hough. Although the Brahms can take your breath away with it's size, scope, power, beauty, and 50 more adjectives, the orchestra played each piece at a very high level and made this concert was one of the best this season. The program began with a tribute from the cello section to the great cellist Rostropovitch, who died last week. The cellos played a Bach piece, which I assume was a transcription. The music was noble and graceful and a wonderful way to acknowledge the life of a major, major artist. I talked with one of the violinists after the concert, and he said that this piece came as a complete surprise, because it wasn't mentioned in the rehearsals. I like this kind of touch because it adds a genuineness to the concert. Stravinsky's Concerto for String Orchestra evoked the atmosphere of a conversation between different sections of the strings. While one group had the talking stick the other sections would grumble. I heard a lot of elegant phrasing - especially when the sound suddenly dissipated. One of the movements ended with the basses alone playing a softly in their upper register. That was a magical moment that seemed un-Stravinsky like. The orchestra wonderfully performed Lutoslowski's Concerto for Orchestra. This piece is on the orchestra's first recording, Bravura, which was released in 1987, but the last time it was on a classical music program here was 1995. I liked the underlying tension of the piece with its myriad of angular and agitated sounds that are driven by a constantly changing meter. The waves of tone clusters were marvelous. The passacaglia in the final movement was striking, beginning with the basses and moving through other sections of the orchestra. (Sometimes I want to disconnect the air conditioning system in the Schnitz when things get real quiet, because it's too loud.) Guest concertmaster Madeline Adkins put a fluid touch on her solo passages that seemed perfect. The concert ended with Stephen Hough and the orchestra delivering a tremendous performance of Brahms' Concerto No. 2 in B-flat major for Piano and Orchestra. The performance was awesome! Hough created a powerful, exciting, and precise statement in the opening movement. The second movement was equally thrilling, and it always amazes me when an artist like Hough can slow down in the middle of a complicated passage and then speed up again and do this in a natural, unaffected manner. The dreamy and tender third movement was another highlight as principal cellist Nancy Ives warmly introduced the main theme. The fourth movement ended the concert with hopeful, triumphant music that elicited an overwhelmingly enthusiastic response from the audience. PSU Opera presents delightful "Cosi"
PSU's production of Mozart's "Cosi fan tutti" sparkled with wit and elan, making opening night (Friday, April 27th) a thoroughly enjoyable experience. A strong cast of young, agile singers captured the spirit of this opera buffa with excellent comedic timing, and the audience, a full house, ate up the antics and the beautiful singing with gusto. Soprano Allison Armerding created a passionate Fiordiligi with a thrilling voice and natural acting ability. It's hard to believe that this was her first appearance in an operatic role. As Fiordiligi's sister Dorobella, Anna Viemeister sang with conviction and a warm, rich tone that she maintained throughout - even when she was doing all of the work on the teeter-totter. In the role of young officers who are in love with the two noblewomen, both baritone Sojourn Breneiser and tenor Wesley Rogers were terrific. Rogers did an outstanding job with the difficult, soul searching aria "Un aura amorosa" in which he has to reveal his hatred and love for Dorabella. Bass Jim Rose settled into the role of the old philospher Don Alfonso with a wink and a nod. Soprano Dresden Merz, as the ladies' chambermaid, Despina, added a lot of mirth, but her voice needed to be a little stronger to be heard over the orchestra. Tito Capobianco provided superb stage directions for the cast, which added clarity and hilarity to the story. Excellent set design by Carey Wong used rear projections of Naples and Mt. Vesuvius in a way that reflected the mood of the characters. For example, when two lovers would kiss, the volcano would erupt. And the lighting by Jeff Forbes enhanced the production. Conductor Ken Selden led the orchestra with judicious pacing. The orchestra experienced a multitude of problems with intonation, but the music never flagged. This made it easier for the singers to negotiate all of the tricky passages and kept the audience engaged. Kudos also to the exquisite harpsichord playing of Douglas Carl Schneider. Raise your voice and be a champ! On Monday, you have the opportunity to drive to Salem and participate in a rally to help restore state funding of the arts. Governor Kulongoski's $10.9 million budget for Culture, Heritage, Arts, Movies, and Preservation (CHAMP) is being hacked in half by the Ways and Means committee. See Champ Day for the rally information. There are events all day and entertainment, too. You can also write to your legislative representative. The Champ Day web site provides all of this information. Help keep the arts scene in Oregon vibrant! Be a champ! Considered by many to be one of the world's premiere lute players, Ronn McFarlane will perform this Friday, April 27th at 8pm at the Broderick Gallery in a concert sponsored by Classical Millennium. As a member of the acclaimed Baltimore Consort, McFarlane has made ten recordings. He has also done six solo recordings plus four lute song recordings with soprano Julianne Baird and tenor Frederick Urrey. On Friday evening, McFarlane will play pieces by John Dowland, Gregorio Huwet, Adrian LeRoy, Jacques Gallot, Nicholas Dubut, Silvius Weiss, and three of McFarlane's compositions. The cost is only $9 and you are treated to light refreshments! Although I'm not currently singing with the Portland Symphonic Choir, I'm going to go ahead and toot its horn because the PSC has finally released a recording! It's called "Lux Aeterna," and it contains an excellent selection of American choral music. Before I brag any further about this recording I've got to own up to the fact that I'm in it as part of the tenor section. But I'm just one of 120+ singers (in total) who make up the choir, so I think that I can let loose. In a few words, the recording is quite stunning. It actually sounds as good or better than when I was in the concerts, so I have to take off my hat to the recording engineer Rod Evenson. The recording was done at St. Mary's Cathedral, which is a tricky location because a major avenue runs right alongside the church and Harleys or any other loud vehicle results in a retake. The CD starts with a premiere of Bryan Johanson's "Lux aeterna," which he wrote in 2005 for the choir. In the piece, the choir and a solo cello, played gorgeously by Hamilton Cheifetz, create an extended duet that evokes a timeless medieval dance. The CD also includes an Alice Parker/Robert Shaw rendition of Psalm 81 that the Pilgrims and many of the settlers who came West on the Oregon Trail would've loved. Other pieces on the recording are Howard Hanson's "The Cherubic Hymn" (with organist Doug Schneider), Eric Whitacre's "Sleep," Stephen Foster's "Hard Times Come Again No More," Norman Dinerstein's "When David Heard," and William Levi Dawson's "Ezekiel Saw the Wheel." In each piece, the choir maintains a perfect balance among each section, and the diction is outstanding. The sound in "Sleep" is soothing, rich, and soft, and remarkable because it seems to begin in a haze that clarifies and then fades into nowhere. This number is better than any bromide your doctor can prescribe when you're suffering from insomnia. In contrast, if you need an uplifting spark to get your day rolling, you'll want to hear "Ezekiel Saw the Wheel." Kudos to artistic director and conductor Steven Zopfi and the choir for creating a recording that will be memorable for years to come. If you want to celebrate the release of this CD and help out the choir, you should attend the PSC's CD Release Party and Auction this Friday evening at the Multnomah Athletic Club. Entertainment includes performances by the Portland Symphonic Girlchoir, The Royal Blues, and the inimitable Rose City Mixed Quartet. For the next seven days from April 20th through the 27th, the Oregon Symphony is offering all remaining seats for all remaining concerts for either $20 a piece or $50. Kudos to Wells Fargo for supporting this experiment. It'll be interesting to see if the Schnitz will be fuller. Amy Schwartz Moretti, the former concertmaster of the Oregon Symphony, is back in town to play a concert with orchestra this weekend. I talked with her over the phone about her schedule, the upcoming concert, and her work in Georgia at the Robert McDuffie Center for Strings at Mercer University. You've been here a few days, and you've already given a concert? Yes, I played a benefit concert for the Astoria Music Festival at a gorgeous home in Astoria. The weather couldn't have been more beautiful. It was a perfectly clear day. I think that I have a falsified view of Astoria, because I've always had beautiful weather when I've been there. With the Oregon Symphony, y ou'll be playing Chausson's "Poeme" and Tchaikovsky's "Valse-scherzo." Have you played these pieces before? Yes but only with piano accompaniment. For the Chausson "Poeme," you really need an orchestra. When you the orchestra parts are reduced to piano, the piece is still beautiful, but you miss all of the lines that happen in an orchestra -- all of the various melodies. I'm excited to hear all of the color that the orchestra can give. It's all in one movement. I guess Chausson didn't want to write an entire violin concerto. So, I thought of something that would go well with it, and I picked the Tchaikovsky "Valse-scherzo." The Tchaikovsky piece is pure pleasure. It's fun little piece with a lot of showy double stops, runs, and technical things for the violin. It was one of my mom's favorites. So what is happening with your life and work in Georgia? Steve and I have been back there four months, and we've been so busy that we still haven't unpacked everything. I'm doing much more traveling now to preform and see students. The Strings Center offers a great program with a terrific university education and real one-on-one attention. This is something that other schools can't offer. We'll have an incoming freshmen class with 8 to 10 students. They'll get a lot of individual help. Every day in my new job at Mercer University is a challenge. There's always something new that I have to figure out. I'm enjoying the organizational aspect, but a lot of what I do is talk to students, parents, and other teachers across the country. There are so many talented kids here in Portland, like Becky Anderson, and so many wonderful teachers. We're trying to establish conservatory-level training in the Southeast. You recently played concerts in Martha's Vineyard and in Florida, and you'll be back in Portland in July to play with Chamber Music Northwest. What else will you be doing? I'm looking forward playing at the Rome Chamber Music Festival, which is in Rome, Italy. Robert McDuffie is the music director. We intend to tie that festival in with the experience for students at the String Center. They will be building their connections and getting experience in the real world of performance. Wow! I'm sure that a lot of potential students will give that offer serious consideration. Yes, it will help to make our program even more competitive. Good luck with your concert this weekend! Amy Schwartz Moretti plays with the Oregon Symphony this weekend in her farewell concerts on April 21-23. 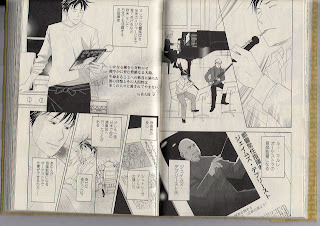 Here are the illustrations that show James DePreist (laureate music director of the Oregon Symphony) in the Japanese comic book called Nodame Cantabile, which tells the story of aspiring young musicians. In this chapter, DePreist appears as an inspiring role model for a conducting student. 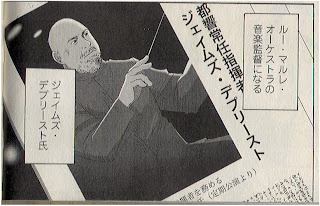 This illustration depicts him in a newspaper and states that DePreist is the Permanent Conductor of the Tokyo Metropolitan Orchestra. The next panel with DePreist says "I went to his concert in Japan, once." The next panel to the left (students in audience) says "Happy night it was." I don't know if any other conductors have appeared in comic strips or if there are any other comics that deal with classical music, but I think that it's terrific that DePreist is a character in this comic. The three young ladies who soloed with the Vancouver Symphony did an excellent job. If you'd like to read my review of the concert, it's in today's issue of The Columbian. Three young musicians, all from Portland, won the Vancouver Symphony's young artist competition and will perform with the orchestra this weekend. The winners are pianist Vivian Chang, saxophonist Nicole Skau, and violinist Nanao Yamada. You read more about them in a preview that I wrote for The Columbian newspaper. Chamber music concerts and recitals are perfect ways in which the Oregon Symphony can reach out to neighborhoods in Portland (and beyond) to connect with people and develop a new audiences. On the the Saturday evening before Easter, Charles Noble, assistant principal violist with the Oregon Symphony, teamed up with several of his colleagues from the orchestra to perform an outstanding concert at the Community Music Center in SE Portland. The concert had an informal flair about it. It was fun. It was just the right thing for Portland, and it's something that should be done more often. First of all, Noble and his colleagues didn't wear formal garb. You could say that the performers were dressed in business casual attire, and that was refreshing. Secondly, Noble told us a little about each piece before it was played. He used a friendly tone and manner to convey information that helped us to digest the music. Thirdly, the concert was a fund raiser for the Community Music Center, which needs all of the help that it can get, since its funding is being cut off by Portland Parks and Recreation. So, the concert was (excuse the pun) a noble event. Noble opened the concert with Henri Vieuxtemps' Capriccio, a short, solo for viola that seemed to serve a nice warm up for both Noble and the audience. The music had a soothing melody in the higher register that was balanced by a slightly sad part in the lower register. I was hoping that something more capricious would jump out, but it never did. Still, the piece was engaging and beautiful. Next came Beethoven's Serenade for flute, violin, and viola. Here, Noble was joined by violinist Shin-young Kwon and flutist David Buck for a delightful voyage down the river of a very tricky five movement piece. Buck, the principal flutist of the OSO, seemed to have an extra reserve of oxygen hidden somewhere in his lungs as he negotiated every passage (many of which were devilishly fast) with incredible artistry. The beauty of the sound that he gets out of a metal tube with holes in it is wonderful, charming, and a pure delight. Kwon, who is a member of the violin section of the OSO, played stunningly. Noble also performed superbly. Remarkably, the sound from the three was very well balanced, too. After intermission, Noble returned with oboist Karen Wagner and pianist Cary Lewis to play Two Rhapsodies by Charles Martin Loeffler. The first rhapsody appealed to me because of its wistful, lovely, far away quality that broke into a sort of free association and then reassembled itself with the oboe and viola playing together with punctuation by the piano. The second rhapsody seemed more disjointed, and my ears and my mind just didn't adjust. However, Wagner (who also plays with the OSO) executed a flawless two octave jump (or maybe more than that) in this piece. Lewis and Noble played well throughout. The last selection was Vieuxtemps' Elegie for viola and piano. Noble clearly knows this piece well because he could play some of it with his eyes nearly closed. He seemed to assert more of his personality with the viola in this piece and with Lewis at the piano, the music made an elegant finale for the concert. I'd like to add that the acoustics at the CMC tend to be very lively, and Lewis did an excellent job at controlling the volume at the piano. Otherwise, he would easily drown out everyone else. Finally, the turn-out was great, nearly every chair was occupied. I noticed many members of the Oregon Symphony in the hall, including conductor Gregory Vajda, Nancy Ives, Johnathan Dubay, and Joel Belgique. This is from last summer, when she played in the Zephyr Music Festival in Italy. Kudos to the classical music paparazzi. On Saturday evening the Oregon Symphony performed three pieces that plumbed the depths of the human quest for spiritual affirmation. In the first half of the concert, the orchestra teamed up with the Portland Symphonic Choir to present a satisfying and incisive performance of Barber's "Prayers of Kierkegaard" and Bernstein's "Chichester Psalms." In the second half, the orchestra went on an incredible tear, digging into the emotional potboiler of Tchaikovsky's Symphony No. 6 (aka, "Pathetique) and delivering a terrific performance. Since I have spent many years singing with the Portland Symphonic Choir (although not this past season), my opinion isn't entirely without bias. But from my seat in the lower balcony, I loved the well-balanced sound of their voices. By putting the basses and altos in the middle of the choir loft, Kalmar seems to have found a solution in which the lower vocal sound doesn't get lost. The choir also sang with clear diction, unless the orchestra played at forte level. After that point, all I could hear from the choir were the sopranos -- especially in the Barber piece. The Bernstein number has some really tricky attacks for the men, and they expertly handled all of them. The boy soprano, Logan Stugart, more than held his own and delivered his solos very well. Kudos also to Jeffrey Work for his snarky trumpet sound in the second movement and to Nancy Ives and Joel Belgique for their wonderful duet at the end of the piece. The orchestra played exceedingly well in the Tchaikovsky symphony. From the first ominous and haunting sound of the bassoons at the outset to the final anguished, dying heartbeat in the basses in the last measures, this performance wrung out every note of the emotional and spiritual turmoil of this incredible masterpiece. I loved watching the strings -- all of them --- having fun with this piece -- which I think that have played many times -- but they seem not to get tired of it and instead found new ways to probe the depths of this music. Although I didn't know the oboist and the violinist who died a month or so ago, I couldn't help but think that some of this music was played for them. This concert repeats on Monday night; so get a ticket if any are available.